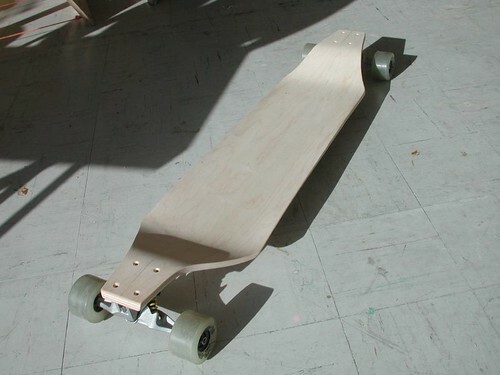 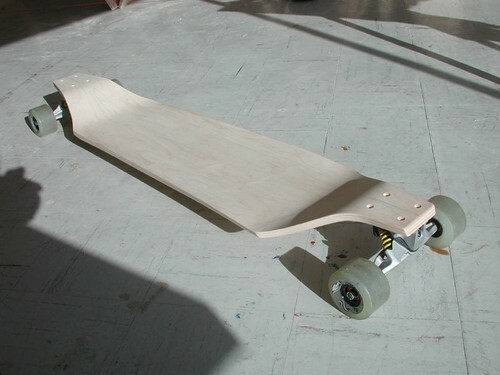 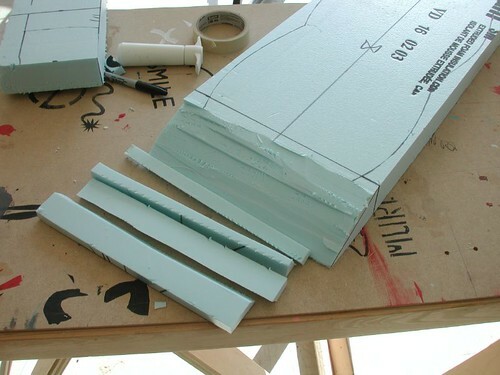 In order to properly build this deck it is essential to review my FOOLPROOF DIY SKATEBOARD FOAM MOLD BUILD to see how to design your deck templates and how to shape your foam mold. 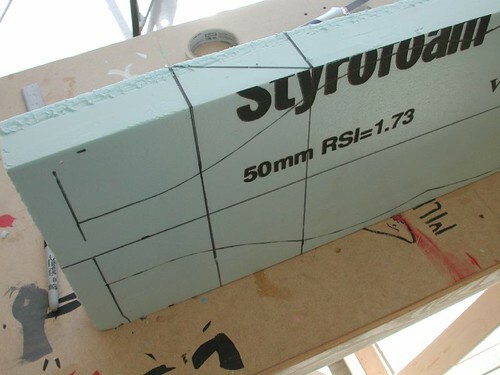 Cut your 2″ thick Styrofoam sheet to the total length of your deck (my foam is 42″ X 11″). 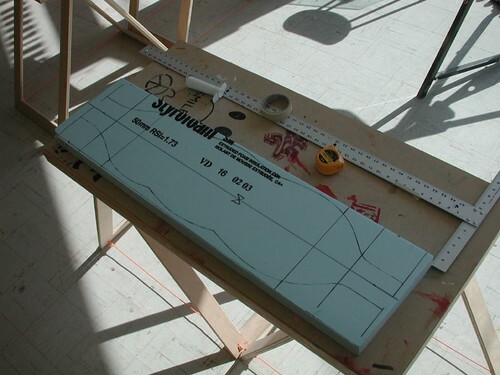 It is important to correctly design your templates as it will give you the measurments for laying out your cut lines on your piece of foam. 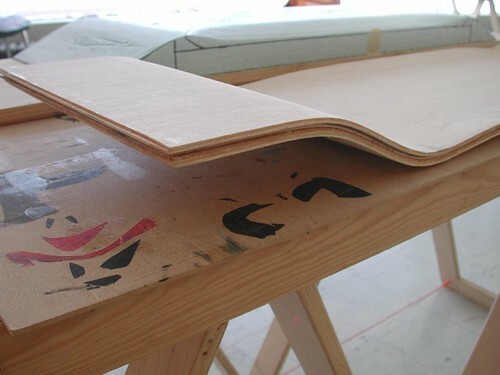 The templates can be reused to design many future decks. 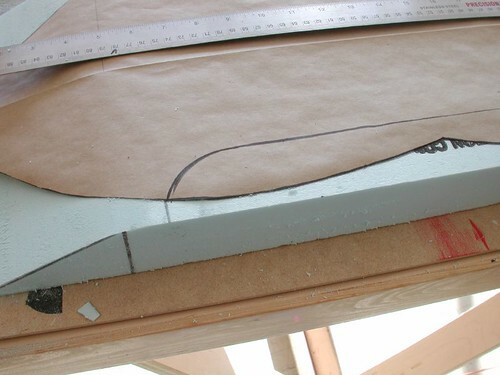 It is good to file your templates away somewhere safe. 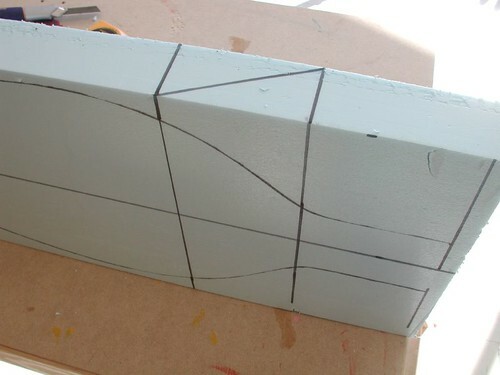 Here you can see I have transfered my lines onto the foam. 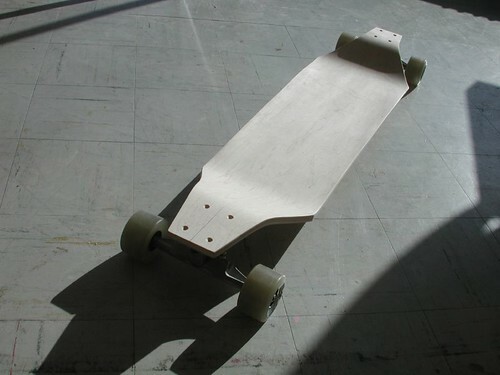 This is the shape I finally decided would work for this build. 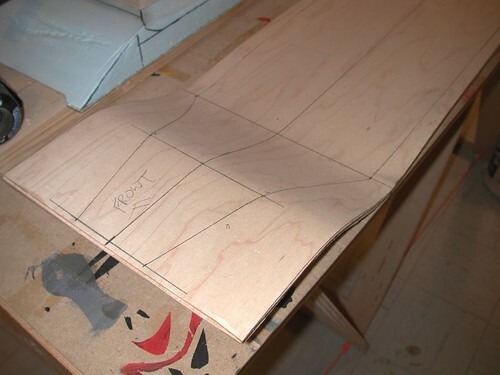 I laid out my measurements and used Google Sketch to do the drawing. 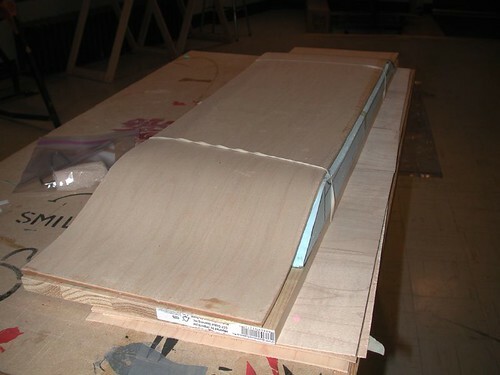 The overal length of the deck became 41 1/4″. 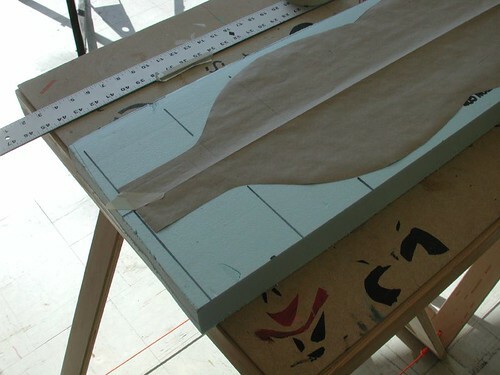 Larger image here. 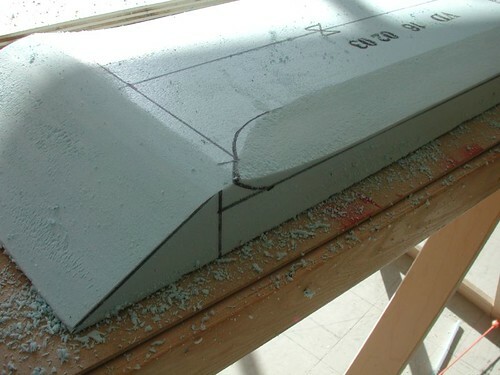 Back to my original design: I have transfered all my measurments to the foam using a black marker. 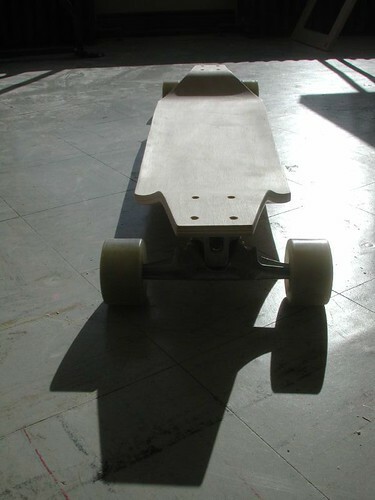 Make sure you have drawn a center line along the length of the deck. 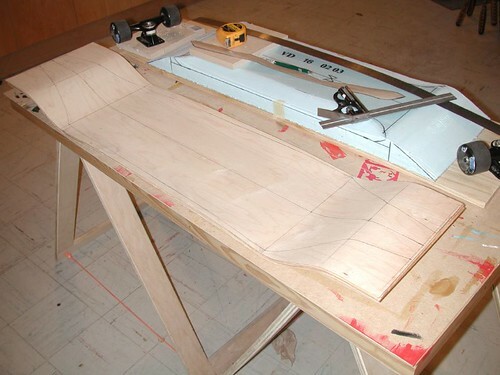 Now add the side profile lines of the drop section wedge. 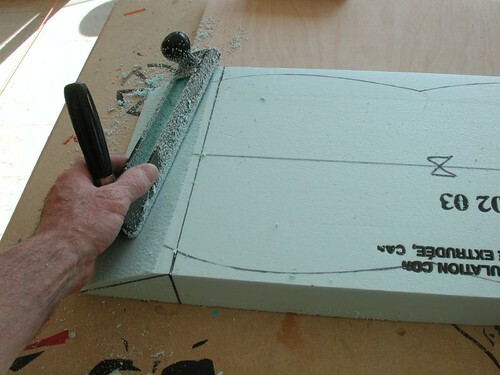 Cut out your drop at either end of the foam mold. 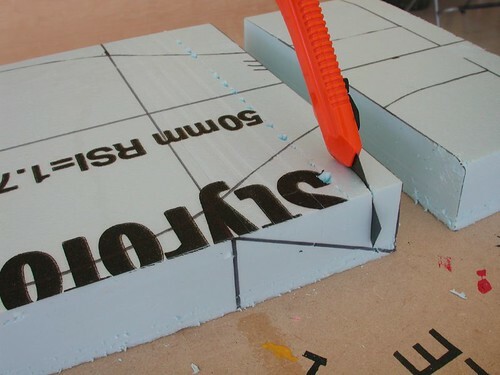 Score the foam with a utility knife and remember not to cut past the black line. 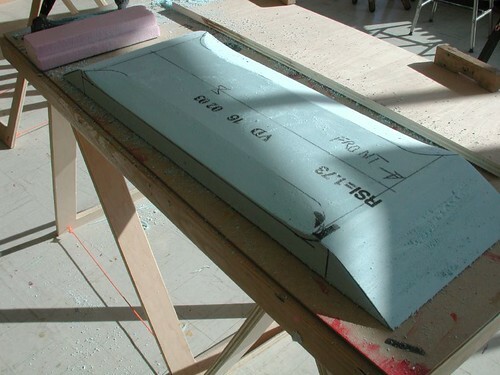 For more information refer to the Skateboard Foam Mold Build tutorial. 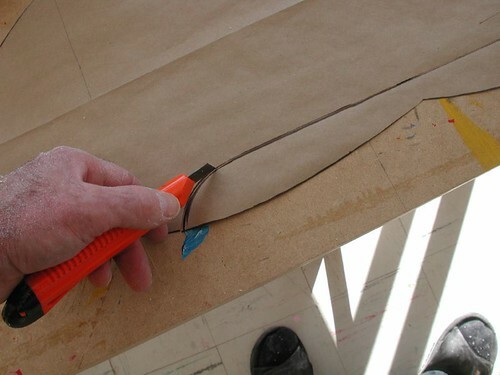 If you take the knife and slice horizontally you will be able to remove all the excess. 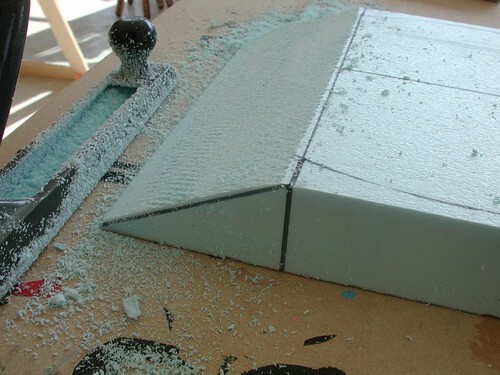 Using a foam block with griptape (or sandpaper) glued to one surface, sand across the form until you are at the template lines. 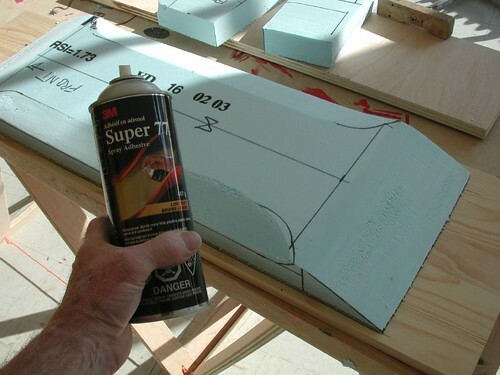 Repeat the surform and sanding steps to the other end of your deck. 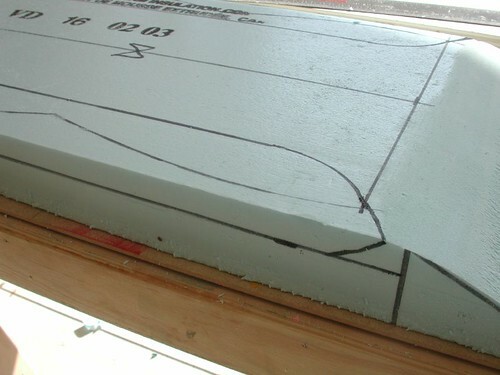 Once you have finished bevelling the foam mold, draw a secondary line about 1″ from the top line as shown below. 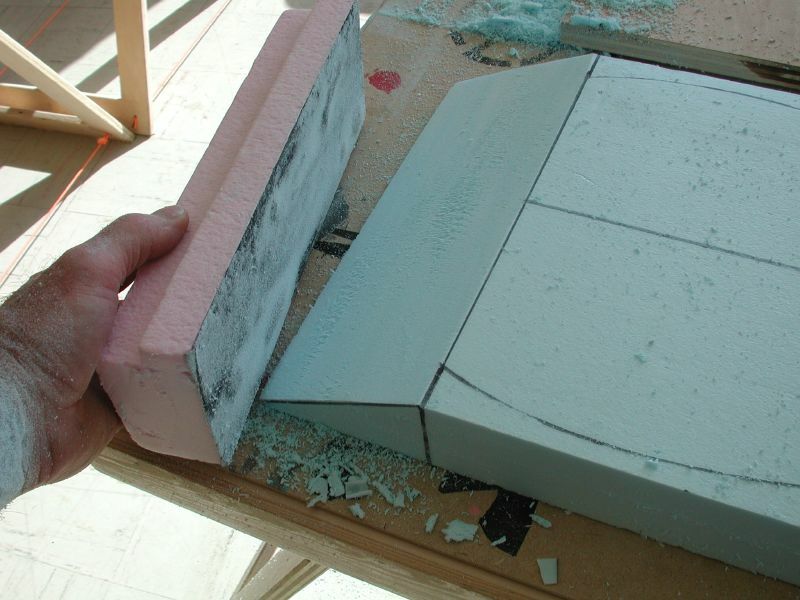 Slightly round off the top corner of your mold. 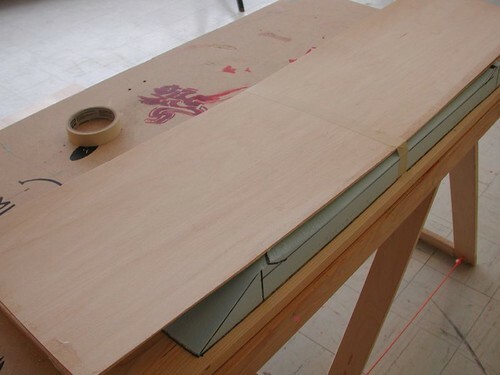 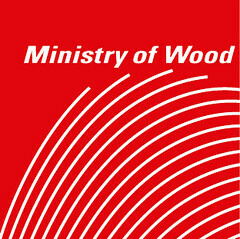 Do not sand beyond your 1″ line. 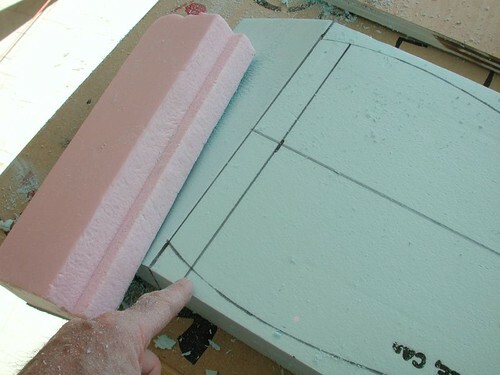 That’s all you need to do to the foam. 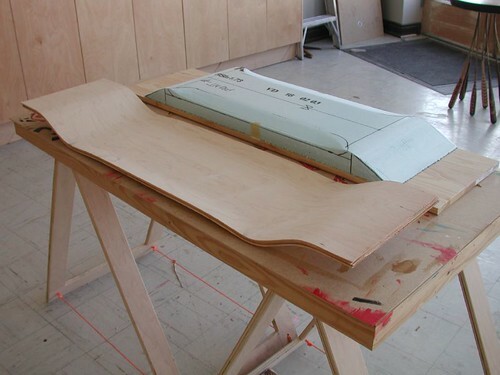 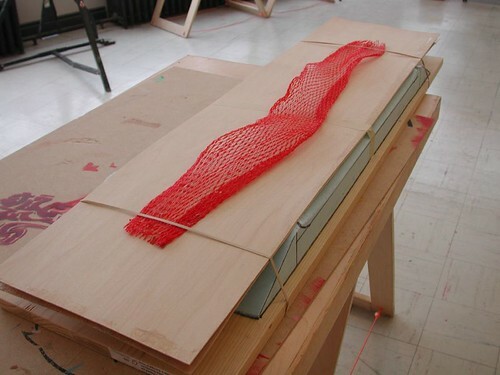 The next step is to cut a piece of 3/4″ plywood 11″ wide by 42″ long. 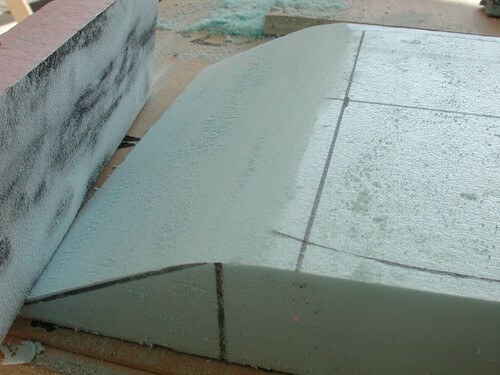 (particleboard or solid wood would also work) You can see I have placed the solidwood (pine) underneath the foam. 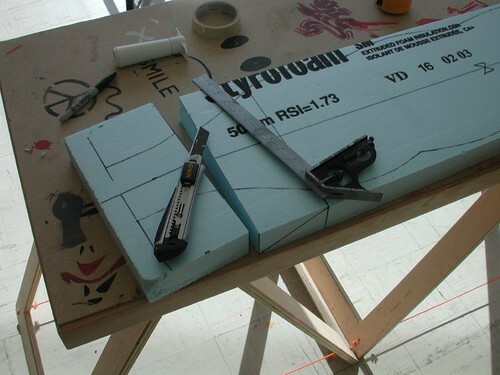 I attached the foam to the plywood with spray adhesive. 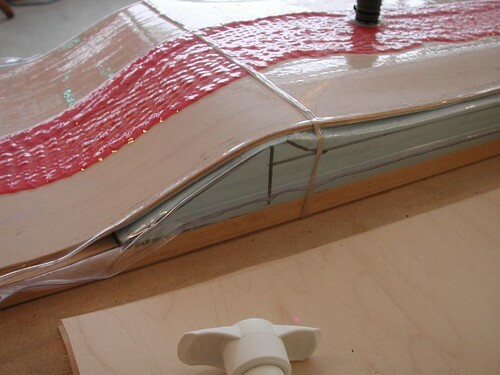 You could also use doublesided tape for this. 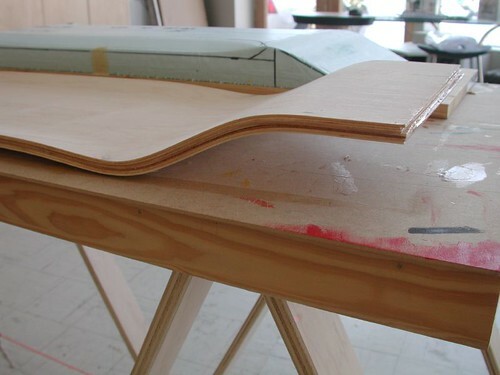 Make sure you follow the measurements from your template for this step so that your veneer will be supported by the plywood. 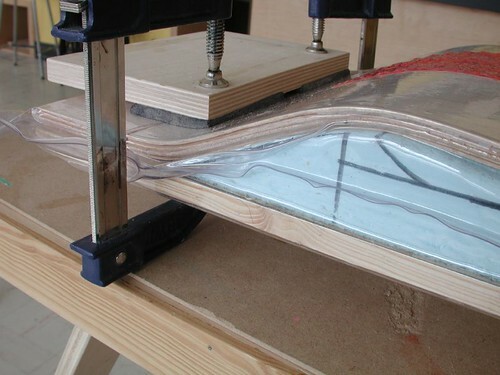 This shows the two layers glued together after removing it from the TAP bag. 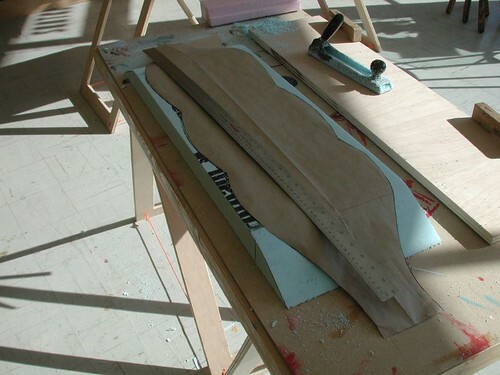 The two layers of veneer will be pretty flexible, but that will change when more layers are added. 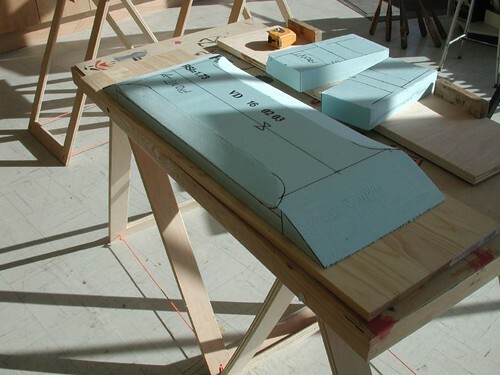 Using Titebond III, I was able to do the next glue up 4 hours after the first. 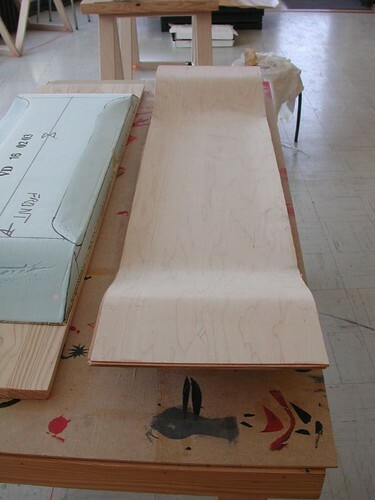 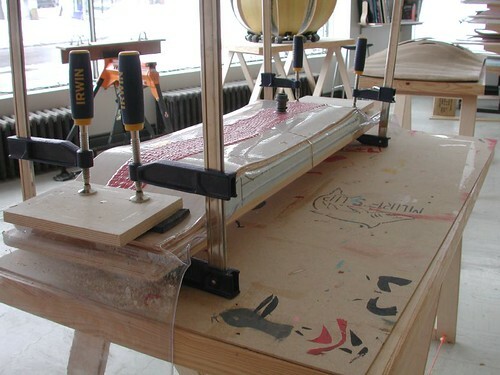 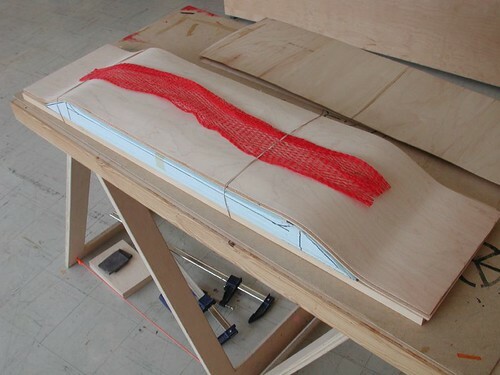 On the next glue up I decided to try clamping 11″ X 4″ pieces of plywood onto the top of the drop curve as shown below. 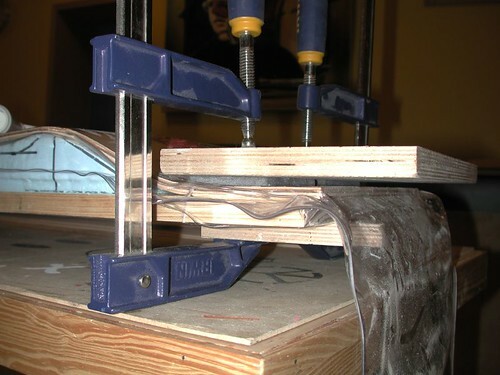 You should not place clamps directly against the TAP bag. 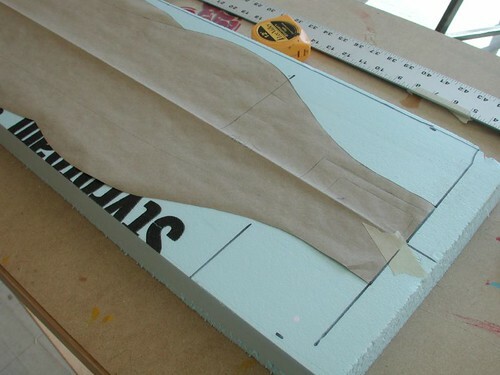 I placed 1/4″ felt pads between the plywood and TAP bag, newspaper or even 1/4″ cut foam would do the trick. 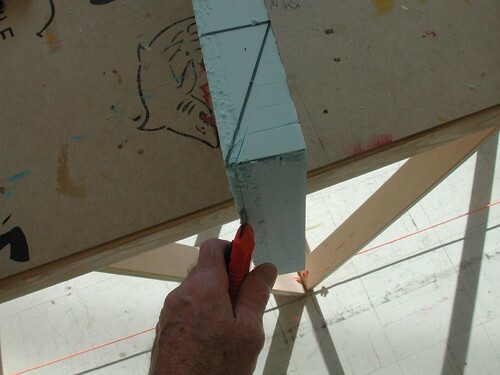 This step is not necessary but helps to ensure the drop area is flat for the truck mounts. 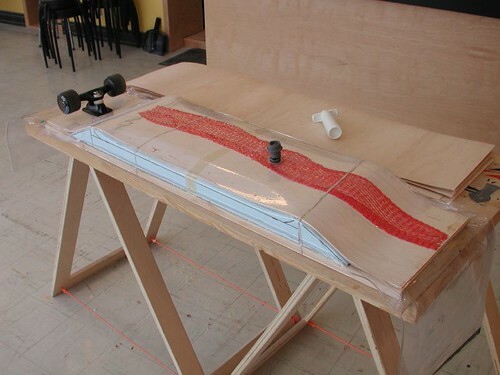 … and the final 8 layers are in the press. 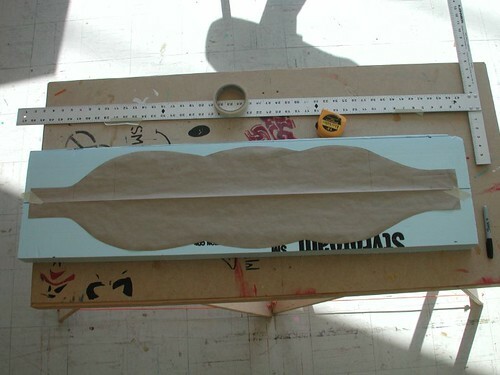 This time I waited 8 hours before I took it out of the press to make sure the glue had lots of time to dry. 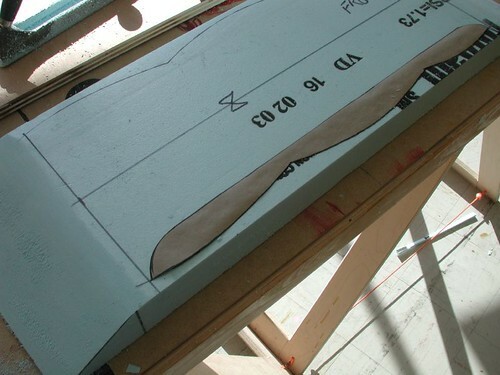 The whole gluing/pressing process will take a couple of days if you can do a glue up every 4 hours.